Pony Club involves many aspects of learning about horses with events such as Lectures, Quiz's, Riding lessons and Camp. The Quesnel & District Pony Club has a minimum age limit for membership of 6 years old as of the date of joining. The last year in which anyone is eligible is the year in which they have their 21st birthday. 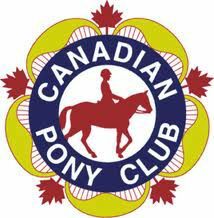 It is mandatory that all members of the Canadian Pony Club to be members of BC Horse Council. It starts in the fall with the members studying (lectures) in a classroom setting. They learn about the horse anatomy and identifying the different breeds. Stable management- feeding, taking care of and keep their horse safe, reasons for grooming their horse and how to care for a horse after strenuous work. Quiz is not a compulsory segment of Pony Club but is a fun activity, in which a Pony Clubber's theoretical knowledge of horsemanship and of various Pony Club activities is tested. In Quiz, our Pony Club members compete as teams...without horses or ponies against other Clubs in our region. Quiz tests knowledge, not skills. In April there is a National written test, Quiz helps prepares them for this test. The riding lessons start in April consist of dressage and jumping. Dressage relates to basic flat work. Almost all work is done on the flat. The rider learns proper use of the natural aids - hands, legs, and seat to guide and control the horse. The horse learns balance, straightness, rhythm, impulsion, extension and collection. Dressage means conditioning of the horse's mind, timing his responses giving the impression that horse and rider are a pair working as one. It is the foundation from which all of the riding disciplines within Pony Club. Beginner levels emphasize walk, trot, and canter on a straight line and in circles. Pony Club involves many aspects of learning about horses with events such as Dressage is, at its lower levels, basic training for horse and rider. At its highest levels, it is art. (Just watch Grand Prix riders on their top level horses to see what this means.) Dressage builds flexibility, obedience and gymnastic ability in the horse...very important for later jumping. Show jumping tests a rider's ability to combine speed with accuracy over a stadium course comprised of knockdown jumps. In the higher levels cross country jumping is done over wooden jumps set in an enclosed field. Pony Club Camp is a fun activity. This camp is for Quesnel Pony Clubber's only and is held at Alex Fraser Park in May. This is an action packed weekend where the members learn hands on about stable management and have riding lessons. All the material that they have been learning in the classroom is put into practice. They play, think and talk about horses all weekend long. In the fall the members are tested on their riding.